Complete this registration form to apply for a place for your child at one of our Wasps Link Club settings. Someone will contact you shortly after submission to let you know what to do next. Please read our Parent/Guardian Contract below before submission. Alternatively you may prefer to download the registration form below. What does he/she prefer to be called? Tell us about your child's interests, cultural background, likes, dislikes, etc. Title * Mr, Mrs, Miss, Dr, etc. Does anyone else have parental responsibility? I understand that the club has policies and procedures and I agree to abide by them, I am aware that copies are onsite for me to view or I can request copies to keep. I understand that Wasps is a play/care facility and that whilst my child is there Wasps is legally responsible for him/her during the times of my booking. My child will only be collected and signed out by a named person authorised to do so. My child will be provided with snacks and drinks whilst at the club unless otherwise requested, I will prove the setting with any specific dietary requirements for my child. I will inform the club if my child will be absent from a booked session, I am aware that all sessions will be charged regardless of attendance. Once I have passed my requirements to the setting, this is classed as a permanent booking. I am aware that it is my responsibility to advise if changes need to be made, and that a months written notice is required for any changes. I will pay promptly for sessions monthly in advance, late payments will be subjected to a charge of £5 per week. I am aware that failure to do so will result in the immediate loss of my child’s place within the setting. It is my responsibility to keep the club manager informed of any alterations to the information regarding my child, such as medical conditions and special dietary needs. I accept that whilst at Wasps my child may get involved in messy activities and I will provide my child with appropriate clothing to accommodate this. Wasps closes at 6.00pm. If, due to unforeseen circumstances I am going to be late, I will contact the manager and if possible arrange for my child’s collection. If my child is not collected by 6.00pm I will pay a charge of £15 per quarter of an hour to cover the costs of the two staff who are legally required to stay. Whilst we try to ensure the safety and security of children’s personal items, we cannot be held responsible for anything is lost or stolen and urge children not to bring personal items to club. If my child has an accident, he/she will be treated by a qualified first aider and I will be informed of the situation as soon as possible. Should the situation dictate that my child needs urgent medical treatment and I am unavailable, a member of staff from Wasps may accompany my child to hospital. 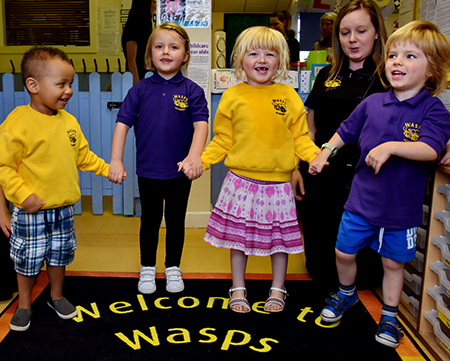 If I am a parent eligible to receive Tax Credits in relation to childcare, I am aware that Wasps is legally obliged to notify the HMRC if I cease to use the service during the period of my claim. I am aware that I will need to complete a registration form, however should any details change throughout the year, such as mobile phone, work contact details, I will inform Wasps. Should I require a holiday place for my child, I understand that I will need to complete my booking request at least 3 working days before commencement of the holiday week, later booking may be accepted, but will incur an additional administration charge of £10 per booking. By submitting the form above you confirm you have read and understood these terms and conditions and agree to abide by them.